The Hays Street Bridge was originally built by the Southern Pacific railroad to help carriages cross over two railroad tracks on Hays Street. It consists of two iron truss spans, a 225 foot Phoenix Whipple span and a 130 foot Pratt span, which were relocated by the then Galveston, Harrisburg & San Antonio Railway Co. from other parts of their rail lines. The bridges were originally designed by the Phoenix Bridge Company and were relocated to their current position around 1910. After years of use, the bridge fell into disrepair and was eventually deemed structurally deficient in the 1980s. Later, in the 1990s several calls to replace the bridge were met by opposition from local residents. Douglas Steadman, the president of the W.E. 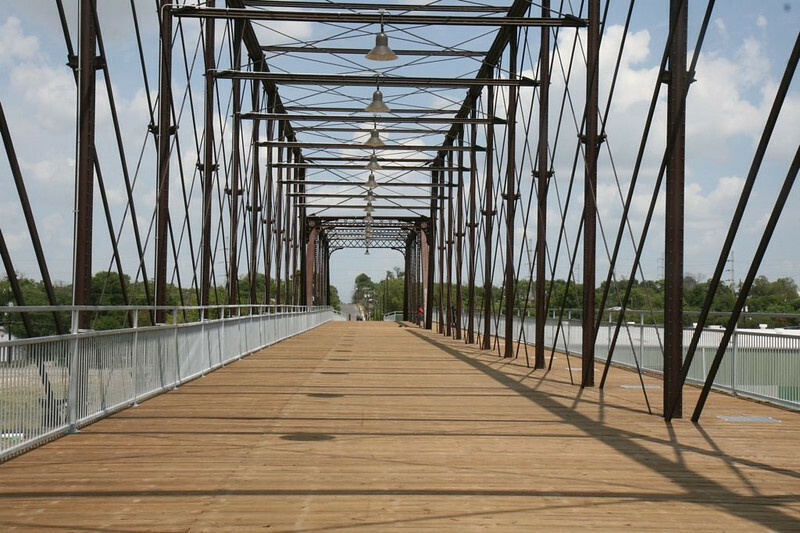 Simpson Company brought attention to the historical significance of the trusses and helped to get the bridge designated as a Civil Engineering Landmark. The efforts of Douglas Steadman and other local activists lead to a Transportation Enhancement award of $2.88 million and a local match of $720,000. With these funds work began to rehabilitate the popular bridge in 2010. The work included rebuilding the two elevated concrete approaches, structurally rehabilitating and painting the truss spans, adding lighting, landscaping, and the addition of interpretive signs. The bridge reopened in August of 2011.